As of 2017, Google Search is the undeniable leader of the global search engine market, boasting a 86 percent market share. From its beginnings as a simple search index, Google moved on to expand its services to online advertising, email and social networking, smartphones, PCs and even home electronics, just to name a few ventures, all these activities bringing the company some 89.46 billion U.S. dollars in total revenue in 2016 alone. However, there are some regional differences in terms of search engine popularity. 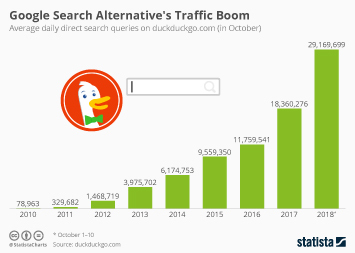 In the United States for example, although Google sites are constantly leading the market, the second-ranked search engine is not a stable position. In 2010, Yahoo’s sites were the second most popular pages for finding information online, but by 2016 they have fallen to third place, being replaced by Microsoft services. There are also regions where Google is not the most popular search engine altogether, such as Russia, where the local internet company Yandex is the market leader, or China, where Google services are blocked. Currently, the most important player in the Chinese market is Baidu. The main driving force behind the development of the many search engines around the world and their ability to stay online, providing more and more accurate and relevant results, is the use of digital marketing. On a global level, the paid search advertising is constantly growing and it set to reach expenditures worth over 101.7 billion U.S. dollars by 2019. The strongest segment on this market is search marketing, where companies and search engines use online advertisements which match user queries, thus reaching target audiences in an almost seamless way. One of the biggest changes of the last decade in terms of search engine user behavior is the growing adoption of mobile devices for web queries. In an increasingly mobile-first environment, mobile search is one of the most relevant digital topics. Between 2014 and 2020, the number of mobile search users is forecast to increase by almost 100 million users, reaching some 221 million U.S. mobile search users in total. Furthermore, as of the fourth quarter of 2016, it was found that mobile devices accounted for 51 percent of organic search engine visits, organic referring to searches where results are relevant to the inquiry and do not feature ads hidden and made to look as true results. Unsurprisingly, Google is also the leading mobile search provider in the United States, accounting for more than 90 percent of the mobile search market. Search is also set to account for the second-largest segment of mobile advertising expenditure in 2021 with over 23 billion U.S. dollars. How many times have you used the internet to find a local business in the last 12 months? To what degree has using your smart home device replaced using your smartphone for the following activities while at home? More interesting topics from the industry "Search Engines & SEO"